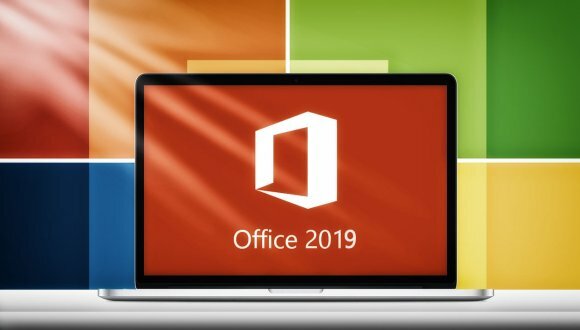 Microsoft Office 2019 is out, learn how to use it like a pro. 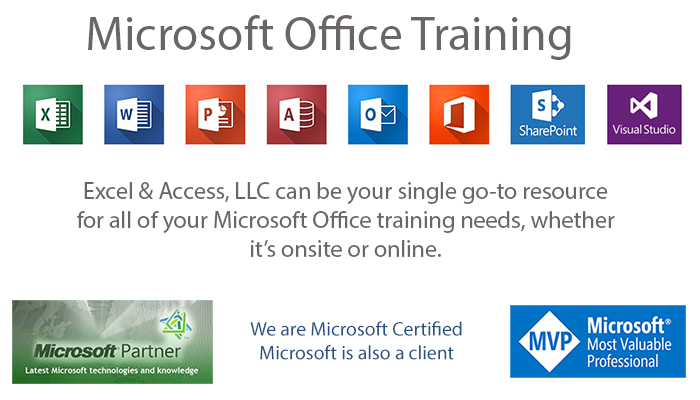 ♦ Let the Microsoft Certified Excel and Access experts at the Excel & Access, LLC group of companies be be your single go-to resource for all of your Microsoft Office Training needs as well as your Microsoft database (Access, SQL Server, Azure, Power BI) training needs, whether it’s onsite or online. ♦ You and/or your employees are guaranteed to walk away from our 100% custom tailored training with mission accomplished; they learned what they came to learn, and then some. It is 100% custom to your exact needs, so much so that we call it our Smarter Microsoft Training as you learn only what you want to learn, no time wasted and you will learn the materials very quickly. ♦ Your team will learn so much from our international team of Microsoft trainers that the training will quickly pay for itself, many times over, year after year. ♦ In many organizations Microsoft Office users are slaves to the Microsoft Office Suite of desktop productivity applications, our goal is the make the various Microsoft business applications work for you! Pay once, use it going forward, save time, which is money, each time you run it. That is Smarter Microsoft Training. What sets up apart from other Microsoft training organizations? No matter which Microsoft application you or your team need to learn, we can assist you with that as we are training experts in all of the Microsoft applications. Professional Training Staff – Our trainers are Microsoft Certified Partners, Microsoft MVP’s, authors, collegiate-level course-ware developers, and full-time professional Microsoft application consultants, programmers and trainers, many of whom have spent a great deal of time working for Fortune 100+ organizations in a variety of industries/sectors. We speak business, and modeling our training based on an in-depth understanding of business needs allows us to deliver superior training. Training Content Specifically Developed for You – Our training is developed specifically for you and your needs; we do not use “canned” presentation materials that don’t specifically speak to your particular situation, and we don’t try to sell you books or materials that you don’t need. Our primary goal is that you walk away a more proficient Office user, and we do that by tailoring the training content to and for you. Reasonable Rates – We don’t charge on a per person basis, but by the hour/day, and we encourage you to have as many people attend training as possible in order to maximize your training dollars. We’re comfortable with one-on-one, medium, small or large group settings either onsite or online. However, we actually prefer onsite training, as our trainers are able to impart much more information to your employees simply due to the value of physical interaction. Hands-On Training – We encourage hands-on training in which participants are actively engaged in working with a particular application vs. lecture based training, which often leaves participants lacking. After-Training Support – We stand behind our training, and encourage participants to contact their trainer with any questions after the training, whether it’s two days or two months later. We generally cover a lot of material, and understand that participants will not retain it all, so we also leave participants with working examples of the training material, so that it can be used for reference. We can accommodate both training mediums depending on your needs. Onsite training is great for larger groups that can be broken down into categories (e.g. Beginner, Intermediate, Advanced), where training can be structured to meet the needs of each group. Onsite training generally requires at least a 4 hour commitment per group simply to allow people adequate time for travel and set aside time from work, as well as justifying your trainer’s travel expenses. As mentioned, we charge by the session, not the number of attendees, so we encourage you to include as many participants as a venue can manage efficiently. Online training is often better suited to smaller groups with a similar focus (e.g. Pivot Tables, Power Pivot, etc.). Online training is usually broken up into a series of short sessions in order to be mindful of attendee schedules and to keep everyone as focused as possible. As with Onsite vs. Online training, we can provide both depending on which method best suits your needs. Group training generally has a greater immediate impact on an entire organization simply due to the number of participants you can include. It also lends itself well to creating spin-off sessions after training to address particular issues that a smaller group or department might be facing. Group training is best suited to onsite situations. One-on-One training is more focused to meeting the needs of an individual or small group of attendees, and is generally highly specific, often focusing on an actual issue that they face within the working environment. One-on-One training is also a great way to get individual employees up to speed on a particular application or function that they may need in order to meet new job requirements. Due to travel expenses, One-on-One training is best suited to online situations. Proficiency Survey – We start by giving you access to a proficiency survey in the application of your choice, which gives us a good idea of what you need. If your users are beginners, we’re not going to give intermediate or advanced level training that would leave them lost. Conversely, if your users are advanced, we wouldn’t waste their time focusing on beginner topics. We aim to provide the appropriate level of training for your employees. Paying for training that doesn’t adequately address your needs just wastes your time and money. Internal Document Review – If possible, we review examples of your most common Microsoft Office documents, be it Excel workbooks, Access databases, PowerPoint Presentations, etc. This helps us better understand the challenges faced by your particular business, and helps us to develop training materials specific to you. Any materials shared with us will be reviewed on a strict Non-Disclosure basis; your information is yours and no one else’s. Workshops – Our trainers make themselves available both before and after training to answer specific group or individual needs. We also encourage dedicated working group discussion to address specific needs. If you would like to discuss your organization’s Microsoft Excel, Access, or Office training needs give us a call, send an email, or reach out via chat. 877-392-3539. We can discuss exactly how we will take your team to the next level of Microsoft Office use. Posted on December 19, 2015 Posted in Blog Category, Using Microsoft Applications and tagged Microsoft Training, Irvine Training, Microsoft Office Training.